Barbara Priest, Instrumental Music Director for Pacific Grove Middle School, has won the prestigious 2009 California Music Educator’s Association (CMEA) Outstanding Music Educator award for the Central Coast Section of the CMEA. Fellow music teachers voted for their choice in the Central Coast Section. There are eight sections in California. 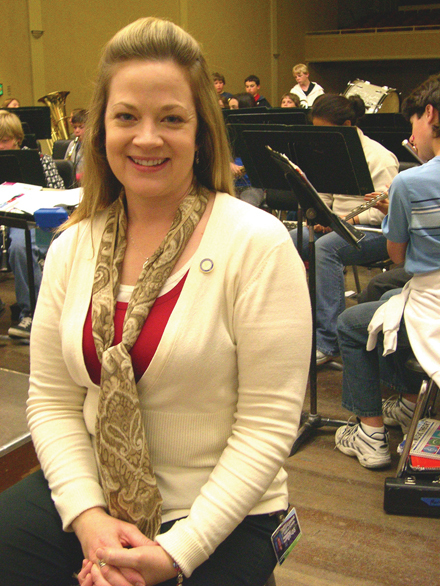 Priest, shown above at a rehearsal of her beginning band class, will receive the award plaque at the Gala Awards Banquet at the CMEA State conference in Ontario this March. Priest is also the PGUSD Music Coordinator, CMEA-CCS Board President Elect, and the Pacific Grove Performing Arts Center Foundation Board and Facility Coordinator.